Scratch ‘n Shapes aren’t your ordinary cardboard scratchers. 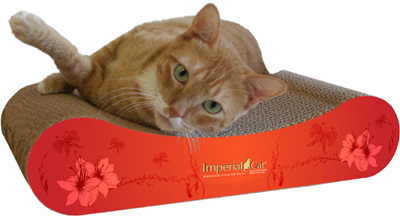 Imperial Cat has created a giant bunch of fun shapes for kitty (and their owners). These modern and eco-friendly scratchers come in more than 80 interesting shapes like orca, turtle or whale. I received a free scratcher for review from Imperial Cat. See my disclosures page for more info. How are Scratch ‘n Shapes eco-friendly? • They’re made with 100 percent recycled paper. • They include organic catnip, yum. • They’re printed with soy-based inks. • They’re made in the United States. • Plus, you can recycle them when you and kitty deem the time is right. 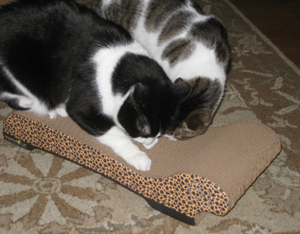 Choco (black and white kitty below) loves his Scratch ‘n Shapes Cheetah Chaise! He was interested from the very beginning. My other cat Oscar seen sniffing the scratcher prefers carpet scratchers (sigh). I’ve purchased other cardboard scratchers made of recycled paper, but Scratch ‘n Shapes is unique since it looks more like a piece of furniture. It doesn’t stick out so much. Also, it seems to be more sturdy than some other cardboard scratchers we’ve tried. I haven’t noticed excessive cardboard scraps lying around. Choco doesn’t need catnip on his scratcher to be attracted to it, but he enjoyed the organic catnip very much. In fact, he started eating it! As you can tell, Choco loved not only scratching his chaise and eating some catnip, but also just lounging around. It’s great that these scratchers come with organic and apparently tasty catnip, but I found that the catnip didn’t stay on the scratcher. Once I relocated the scratcher, I noticed a pile of catnip that had fallen through the bottom or somehow escaped through a mystery method. I suppose this is one disadvantage not being an ordinary scratcher encased in a cardboard box. If you go with these scratchers, I suggest applying only a very small amount of catnip at a time. 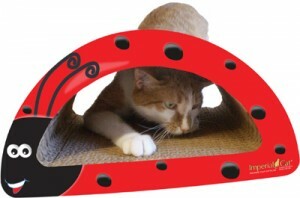 Overall, these durable scratchers are great for kitties who like cardboard and their human companions who want something more decorative. 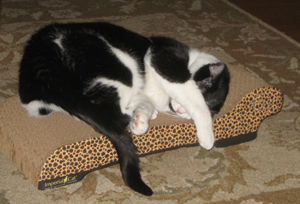 The only disadvantage I could find is that some of the catnip may fall off the scratcher. 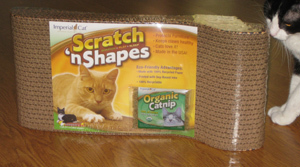 Scratch ‘n Shapes scratchers have many earth-friendly advantages, and they’re made in the USA by a company that works to help shelter cats.